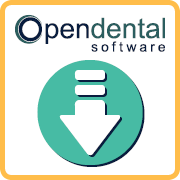 The free trial version of Open Dental can be used to evaluate the software, or be used as the first step when installing the full version. Are you a current user who already has Open Dental installed? See Installing on a Workstation instead. View User Testimonials for existing customer feedback. For operating system requirements, see Computer Requirements. Ensure MySQL is not already installed on the server. See MySQL. If you are installing in Canada, set the Region and Language Settings on your computer to Canada before installing . The trial version will not work if MariaDB is installed on the server computer. The trial version will not expire so it can be used as long as needed to evaluate the software. The trial download includes a blank opendental database and a demo database with fictional patients. The trial does not include copyrighted CDT content (e.g. CDT codes and ADA claim forms). The trial uses temporary codes. CDT codes will be available once a registration key is issued. The trial version is limited to 30 patients. There are two types of installation: to a server or to a workstation. Server: Installs the Open Dental program, mySQL, the database, and the OpenDentImages folder. Workstations: If you have multiple computers, workstations only need the Open Dental program installed. Each workstation will connect to the server to access mySQL, the database and the OpenDentImages folder. See also: Webinar: Installing the Trial Version on a Server. Download the executable by clicking on this link: TrialDownload-18-3-50.exe. When the download is complete, view the executable in the downloads folder. Hint: Select Show in Folder to open Downloads directly. Right-click on the TrialDownload executable and select Run as administrator. Note: A warning may display stating that Windows protected your PC. Click More Info, then Run Anyway. Ensure all boxes are checked. MySQL 5.5 will be installed. If you install MySQL to a different location, verify the same location is entered in the MySQL installation by clicking Custom when prompted. The opendental Database path must be a local path (e.g. C:\mysql\data). The OpenDentImages folder can be installed to any shareable location. In the lower right, click Install. When you reach the MySQL Server Setup window, uncheck the 'Launch the MySQL Instance Configuration Wizard' box then click Finish. You will be prompted to create a MySQL password. This step is optional. If you choose to create a MySQL username and password, do not lose them. They will need to be entered on every workstation from the Choose Database screen. See MySQL Security for a more detailed explanation. a. Share the Open DentImages Folder. b. Add an exception to the Windows Firewall. See Open Port 3306. On the desktop, right-click on the Open Dental icon and select Run as administrator to open the program. On the Choose Database window, enter the server name (localhost or computer name) and select the database to connect to. - opendental (a blank database that allows up to 30 patients). - demo (contains fictional patients and providers). Set the OpenDentImages path to a UNC path (i.e. network path). a. Click Setup, Data Paths. b. Enter the UNC path to the OpenDentImages folder on the server so other workstations can access it. Note: When installing a new trial database, if an 'opendental' database already exists, the new database will be renamed to prevent accidental deletion of the existing database. The new name will have the current date appended, followed by a counter for each new copy made on the same day (e.g. opendental_20190131_2). Follow these instructions to install the trial version to workstations connected to the server. Click Workstation, then click Install. Right-click on the Open Dental icon and select Run as admininstrator. On the Choose Database window, enter the name of the server and select the database. If you created a MySQL username and password on the server, enter those details as well. When Open Dental opens, in the Main Menu, click Graphics, then change the preference to Direct X or Open GL. This will allow treatment to display properly on your tooth chart. When you are ready to purchase Open Dental and Update to the Full Version, contact Open Dental support. Problem: Received an error message after the installation of MySQL. Solution: It's likely the executable was not run as an administrator. Run the installer again by right-clicking on the downloaded file, then selecting Run as administrator. 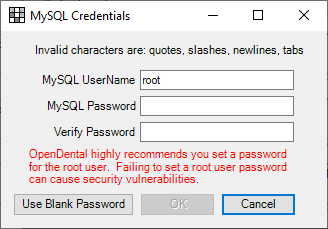 Uncheck the Open Dental Program and MySQL server boxes on the Installer window. You have already successfully installed them. Problem: The installer or the program won't start up at all. Solution: You likely need to install dot Net. See Troubleshooting if you are still having problems, or contact Open Dental support.